A small number of dead fish of various sizes were discovered Tuesday in the Animas River about 5 miles north of Durango. It is likely they suffocated in the ash flowing into the river from the 416 Fire burn scar. An ash flow likely caused a small fish kill in the Animas River north of Durango, and it is likely more fish will die as ash flows into the river from the 416 Fire burn scar. Leah Espinosa and her family found about 20 dead fish in the river on Tuesday about 5 miles north of town on their property. “The river is really, really dark from all the rain and runoff,” she said. It was the first time she has found dead fish on her property, she said. The fish, mostly brown trout, likely suffocated in the ash, said Joe Lewandowski, a spokesman with Colorado Parks and Wildlife. They ranged in size from 3 to 16 inches, he said. “Their gills were pretty much covered with ash,” he said. While the fish were all found in the same spot, it’s impossible to know where they came from because fish will flee from polluted water, he said. It is likely the low water level in the river also contributed to the kill. Lots of water can help dilute ash and sediment and help keep fish alive. It is possible that ash could kill more fish in the Animas River, but there is nothing Colorado Parks and Wildlife officials can do to prevent those deaths, he said. But they are monitoring it. No other fish kills had been reported to wildlife officials as of Wednesday afternoon, Lewandowski said. Ash and other runoff is not expected to hurt the recently reintroduced cutthroat trout, a native fish, in the Hermosa Creek because those fish live above the burn scar, he said. 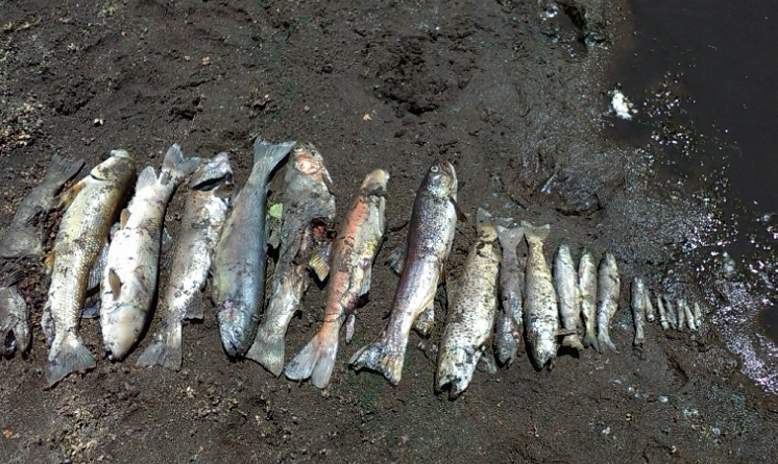 To report fish die-offs in the Animas River or Hermosa Creek, call 247-0855.